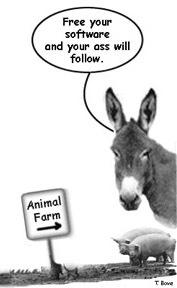 Microsoft users: "It's not your fault, but it is your problem..."
Alternatives and resources by Tony Bove, author of Just Say No to Microsoft. Get off Microsoft blog -- news, updates, links, and comments from the world. 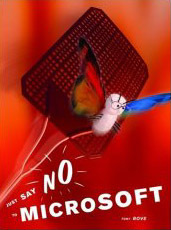 Just Say No to Microsoft book is now available. Read a sample chapter. If you have the book, see the Book Errata page for corrections. Why get off Microsoft? Learn why you should pick the Microsoft lock and set yourself free. How do we get off Microsoft? Learn how to Control-Alt-Delete your Microsoft addiction. How to change Windows Media Player settings to run alternative players on Windows. Stop Word docs! Information about the conspiracy to stop the proliferation of the Microsoft Word document format. from the song Beasts of England"
You can replace the Windows operating system on your PC with a version of Linux or Unix. You can even run an alternative operating system (Linux or Unix) alongside your Windows system. Another alternative is to get a Mac. There are possibly hundreds of different Linux distributions available on the Internet. The companies that package Linux in a distribution -- either on CD-ROM or for downloading -- often include automatic installation programs or wizards that help you through the process of configuring the system for different hardware configurations. Red Hat Enterprise Linux (commercial, based on Open Source) Red Hats wide range of support services is a principal reason why the company and its Linux distribution are successful in the professional IT world. SimplyMEPIS (free, Open Source) SimplyMEPIS recognizes PC components and sets up Flash, Real Player, Mplayer, and Java to work automatically. It includes the KDE desktop environment. Knoppix (free, Open Source) Knoppix, supplied on CD or DVD for a fee, includes GNU/Linux software, automatic hardware detection, and support for many graphics cards, sound cards, and other peripherals. You can start the productive Linux system from the CD or DVD -- it is not necessary to install anything on a hard disk. It includes the KDE desktop environment. Debian (free, Open Source) As enterprise Linux distributions go the commercial route, the Debian project continues to provide a Linux distribution that offers organizations the sort of commodity infrastructure for which Linux was originally known. Not recommended for beginners, Debian is security-conscious, offers solid package management tools, and is easily updated. Linspire is a full-featured operating system (based on Debian) for PC desktops and laptops. It includes a full Internet suite, office suite, digital photo and music managers, and wireless networking. It's CNR "click and run" software delivery service makes it easy to install any of more than 2,000 Linux distributions and packages. Novell Linux Desktop (built on SuSE Linux) is a complete desktop operating system that can also work well with laptops. it provides a user-friendly environment, ease of administration and an excellent enhancement of the OpenOffice.org productivity suite. The Xandros Business System (on CD) looks and acts like a complete replacement for Windows 2000. You can install it alongside your Windows system, leaving your Windows programs and files untouched. It also includes CrossOver Office for migrating custom Windows applications to Linux. The Apple Macintosh runs Mac OS X. Its graphical interface hides its industrial-strength, BSD-based Unix underpinnings, which offer similar memory protection and pre-emptive multitasking features as Windows XP. It comes with every Mac. Office includes Word, Excel, and PowerPoint (among other things). It would be an understatement to say that Office dominates the corporate world. It's as if there were only one type of pencil and one pencil company, and the sharpeners it sold were bulky, clumsy to use, and constantly in need of upgrading. The complexities of Office are even more bewildering today than they were 15 years ago, when it took over the spreadsheet market with Excel. Word is bloated beyond belief. And PowerPoint has stifled the art of persuasion. So what can you do about it? OpenOffice.org for Windows -- alternatives to Word, Excel, and PowerPoint (free, Open Source) OpenOffice.org (OOo) is a complete Office replacement. If you use Word on a PC, OOo Writer offers the easiest transition, matching Word function for function; it even looks just like it. OOo Calc offers the same set of analysis and graphic tools as Excel. OOo Impress offers all the PowerPoint features with some improvements, such as a vertical tool bar for common shortcuts and a floating window for paragraph styles. WordPerfect Office from Corel includes WordPerfect as the Word replacement, Quattro Pro for spreadsheets, and Presentations for presentations. WordPerfect lets you "open the hood" on any section of text and make changes to formatting by changing the codes directly. It can import and save various Word and Office doc formats and RTF files with near perfect back-and-forth compatibility. Presentations has all the features of PowerPoint with additional support for animation and sound within slides. AbiWord -- alternative to Word (free, Open Source) AbiWord looks just like Word, except its icons are larger, it loads faster, and it has less of a memory footprint, using only about 6 MB of RAM compared to Word's 30 MB or more. It doesnt try to match Word feature for feature, but it offers most of the features youd expect. Google Docs -- Word processing Web service (free, AJAX application) A complete word processing and document sharing service, built with AJAX technology, that requires only a browser (no installation on your computer). Google Docs lets you upload your Word documents as well as HTML or text documents, edit them (with collaborators if you wish), save them in Word format, and include them in a blog or publish them to a selected audience. Lotus 1-2-3 (with Lotus Word Pro) -- alternatives to Excel and Word (commercial) The once and (possibly) future king of spreadsheets, Lotus 1-2-3, supported by IBM, offers just about everything you could possibly want to replace Excel. As a bonus, it also includes the SmartSuite applications Lotus Word Pro, Lotus Freelance Graphics, Lotus Approach, and Lotus Organizer. Astound Presentation -- alternative to PowerPoint (commercial) Astound can do PowerPoint stuff, but can also add multimedia effects to imported PowerPoint files that PowerPoint itself cant produce. Astound lets you place multiple objects on a slide with timeline synchronization for precise frame-by-frame animation and synchronizing with sound. OpenOffice.org for Linux -- Replicas of Word, Excel, and PowerPoint applications (free, Open Source) OpenOffice.org (OOo) is a complete Office replacement. OOo Writer matches Word on the PC function for function and even looks just like it. OOo Calc offers the same set of analysis and graphic tools as Excel. OOo Impress offers all the PowerPoint features with some improvements, such as a vertical tool bar for common shortcuts and a floating window for paragraph styles. AbiWord -- Word-like application (free, Open Source) AbiWord looks just like Word, except its icons are larger, it loads faster, and it has a small memory footprint, using only about 6 MB of RAM. It doesnt try to match Word feature for feature, but it offers most of the features youd expect. KOffice -- Replicas of Word, Excel, and PowerPoint (free, Open Source) KOffice is anintegrated office suite for KDE, the K Desktop Environment for versions of Linux and Unix. KWord is word processor that lets you work with frames of text for layout. KSpread offers Excel-like features, and KPresenter offers PowerPoint-like features. The suite includes charting, graphing, drawing, project management, and data management tools. NeoOffice is a complete Office replacement that uses the Mac OS X interface, matching Word on the Mac function for function. NeoOffice is the main development project for making OpenOffice.org run natively on Mac OS X. I use NeoOffice/J (a combination of Carbon and Java), which has all of the features of OpenOffice.org 1.1 X11 (see below). It offers better performance and reliability than the Mac version of Word. It also offers the same set of analysis and graphic tools as Excel, and all the presentation and drawing features of PowerPoint. OpenOffice.org (OOo) X11 for Mac OS X is a complete Office replacement. OOo Writer matches Word on the PC function for function and even looks like the PC version, which is somewhat of a downer as the Mac system offers a better interface (see NeoOffice, above). OOo Calc offers the same set of analysis and graphic tools as Excel. OOo Impress offers all the PowerPoint features with some improvements, such as a vertical tool bar for common shortcuts and a floating window for paragraph styles. AbiWord -- alternative to Mac version of Word (free, Open Source) AbiWord looks just like Word, except its icons are larger, it loads faster, and it has a small memory footprint, using only about 6 MB of RAM. It doesnt try to match Word feature for feature, but it offers most of the features youd expect. Apple's iWork package includes Pages for word processing and page layout, and Keynote 2 for presentations. Pages can import and export Word documents. Keynote can import and export PowerPoint presentations and export PDF, QuickTime and Flash files. This section focuses on suggested replacements for Outlook (email, calendar, and contact list) or Outlook Express (email only). Outlook and Outlook Express are the perfect breeding ground for virus attacks, Internet worms, Trojan Horse viruses, and spyware. Any Visual BASIC programmer with a good understanding of how Windows works can write a virus. It's amazing that these Internet security problems are continually labeled as "email viruses" or "Internet worms" rather than the more correct designation of "Windows viruses" or "Microsoft Outlook viruses." Thunderbird for Windows -- alternative to Outlook or Outlook Express (free, Open Source) Thunderbird offers intelligent spam filters, a quick search feature, and a built-in spell checker. It also includes a Usenet newsgroup reader and a reader for RSS (Really Simple Syndication) feeds such as blogs (web logs) and news updates. Pegasus Mail can act as a complete internal mail system on its own without servers or components and supports the standard email protocols. It offers encryption, text glossaries, strong filtering, and circulation messages. Its fast and requires very little hard drive space..
Eudora offers all the standard email functions and includes excellent filtering tools. You can use Eudora for free if you don't mind seeing banner ads on your desktop as you send and receive email. Fortunately, these ads do not appear in your messages. Thunderbird for Linux -- provides Outlook-like features (free, Open Source) Thunderbird offers intelligent spam filters, a quick search feature, and a built-in spell checker. It also includes a Usenet newsgroup reader and a reader for RSS (Really Simple Syndication) feeds such as blogs (web logs) and news updates. Evolution for GNOME desktop -- provides Outlook-like features (free, Open Source) Evolution provides email, calendaring, tasks, and contact management. It includes intelligent junk mail control, filters, search capabilities, Web calendars, and collaboration functions. It works with the Open Source (free) GNOME desktop environment for Linux and Unix. Evolution 2 for Novell Linux Desktop -- provides Outlook-like features (free, Open Source) Evolution 2 integrates email, calendaring, tasks, and contact management; as part of Novell Linux Desktop, Novell Evolution connects to corporate servers including Novell GroupWise and Microsoft Exchange.. The Mail, Address Book, and iCal applications are provided with every copy of Mac OS X.
Thunderbird for Mac OS X -- provides Outlook-like features (free, Open Source) Thunderbird offers intelligent spam filters, a quick search feature, and a built-in spell checker. It also includes a Usenet newsgroup reader and a reader for RSS (Really Simple Syndication) feeds such as blogs (web logs) and news updates. Gaping security holes in Windows and Internet Explorer open your computer up to adware and spyware that wont leave you alone. And while it provides security settings to stem the flow of malware into your computer, Internet Explorer's settings are so complex that most people don't understand them. Moreover, its interactions with websites are unpredictable and its treatment of website activity is confusing, irritating both website developers and consumers looking for the convenience of personalized service. While the best alternative is to switch to either a Mac or Linux, even those stuck with Windows can still use something better than Internet Explorer for browsing the Web safely. Firefox for Windows -- alternative to Internet Explorer (free, Open Source) Firefox makes it easier to set and change security options for browsing by putting all the security settings in one place. Firefox steers clear of Microsoft's ActiveX, which is one of the main vulnerabilities for unauthorized access to a Windows PC. Firefox also offers pop-up ad blocking, tabbed browsing for quick access to multiple Web pages without having to open multiple windows, and cookie controls. Opera includes pop-up blocking, tabbed browsing, integrated searches, email, RSS Newsfeeds and IRC chat. A version of Opera works well on mobile phones and other devices that require a small memory footprint. Netscape includes pop-up blocking, tabbed browsing, and RSS feeds. It warns you if you come across possible spyware sites, and automatically configures its settings to help protect you. The Passcard Manager remembers all your screen names and passwords and can auto-fill that information on sites. Firefox for Linux -- browser similar to Internet Explorer (free, Open Source) Firefox makes it easier to set and change security options for browsing by putting all the security settings in one place. Firefox also offers pop-up ad blocking, tabbed browsing for quick access to multiple Web pages without having to open multiple windows, and cookie controls. Safari, provided with every copy of Mac OS X, offers a pop-up blocker to stop unwanted pop-up ads and tabbed browsing to help with screen clutter. Firefox for Mac OS X -- browser similar to Internet Explorer (free, Open Source) Firefox makes it easier to set and change security options for browsing by putting all the security settings in one place. Firefox also offers pop-up ad blocking, tabbed browsing for quick access to multiple Web pages without having to open multiple windows, and cookie controls. Opera includes pop-up blocking, tabbed browsing, integrated searches, email, RSS Newsfeeds and IRC chat. Not content with a passive protection system (such as iTunes), Microsoft set up Windows Media Player to obtain information about the songs you rip from CDs and the DVDs you play, and report that information back to Microsoft. That means Microsoft can extend copy protection to the digital versions of songs you rip from your own CDs. Windows Media Player automatically takes over all media on your PC, installs Microsoft's rights management, and spies on your music and video folders. It looks for new things to stuff into its library without your knowledge. How can you keep Windows Media Player from starting automatically, so that you can try other players for your sound and video? Change Windows Media Player options during the setup process or right after installing it. iTunes for Windows (with QuickTime) -- alternative for sound (music and CDs), video clips, streaming video, and online service (free) Apple offers the easiest, fastest, and most successful online music service, but the protected music plays only on Apple iPods. Apple uses FairPlay for protection, which lets you make an unlimited number of copies of song files, play the songs on up to five different computers, and burn an unlimited number of CDs. With QuickTime, iTunes can play video clips, and the QuickTime player can play streaming videos. iTunes supports MP3, its own AAC, lossless compression, and Windows Media files as well as QuickTime and MPEG video. RealPlayer can handle just about every sound and video format you throw at it, and also plays DVDs. RealNetworks integrates its online store within the software and includes detailed descriptions of songs and artists culled from the Rhapsody subscription service. You can play purchased music on up to five computers and burn up to five CDs. RealPlayer also handles video formats and offers TiVo-like pausing and playback of live video and audio streams, with support for 5.1-channel sound when playing DVDs. WinAmp is one of the most popular free music players. WinAmp Pro (about $15) lets you rip CDs into MP3s and burn songs onto CDs as well as or better than any other rip-and-burn application. Both can play video clips and streaming video. It can play MP3 and Windows Media files as well as MPEG video. Intervideo's WinDVD combines all the features of a standard consumer DVD player, and includes the Dolby Surround Compatible option, which (depending on your hardware) gives you 2-channel plus Dolby Pro Logic surround sound. RealPlayer for Linux can handle just about every sound and video format you throw at it, including MP3, AAC, Ogg Vorbis and Theora, and H263. Grip -- alternative for sound (music and CDs) (free, Open Source) Grip is a CD player and ripper for the GNOME desktop environment that provides an automated interface for using MP3 (and other sound format) encoders, for ripping CDs into music files, and for retrieving track information from Internet databases. Grip works with DigitalDJ to provide an integrated music library with DJ playing features. MPlayer -- alternative for sound (music and CDs), video clips, streaming video, DVDs (free, Open Source) MPlayer can play most media files, as well as VideoCD, SVCD, DVD, 3ivx, and even DivX movies. MPlayer is complex and only recommended for programmers. CrossOver Office (based on the WINE project) provides support for popular Windows-based applications. It duplicates the Win32 API, so that software written for the Win32 API can run without any Microsoft code. CrossOver Office offers direct support for the Windows version of iTunes, complete with iPod updating. iTunes (and QuickTime) -- standard Mac application for sound (music and CDs), video clips, streaming video, and online service (free) Apple offers the easiest, fastest, and most successful online music service, but the protected music plays only on Apple iPods. Apple uses FairPlay for protection, which lets you make an unlimited number of copies of song files, play the songs on up to five different computers, and burn an unlimited number of CDs. With QuickTime, iTunes can play video clips, and the QuickTime player can play streaming videos. iTunes supports MP3, its own AAC, lossless compression, and Windows Media files as well as QuickTime and MPEG video. DVD Player, provided with every Mac equipped with a DVD drive, plays encrypted DVDs using licensed CSS decryption code in QuickTime (supplied with every Mac). The newest version offers closed captioning. RealPlayer can handle just about every sound and video format you throw at it, including MP3, AAC, Ogg Vorbis and Theora, and H263. MSN Messenger and Windows Messenger -- a hybrid of instant messaging, video-conferencing, Internet telephone calling, and application sharing -- are arguably the worst instant messaging software available. To use it, you need to sign up for Passport, the latest in Orwellian Internet-tracking software. Not only has Passport has been proven insecure, but MSN Messenger itself has turned out to be buggy and full of privacy holes. Both MSN Messenger and Windows Messenger have been heavily targeted for viruses and worms since 2001. Jabber -- instant messaging (free, Open Source) Jabber is an open, ad-free alternative to consumer IM services like AIM, ICQ, MSN, and Yahoo. Jabber is a set of streaming XML protocols and technologies that enable any two entities on the Internet to exchange messages, presence, and other structured information. GAIM -- instant messaging (free) GAIM is compatible with AIM and ICQ (Oscar protocol), MSN Messenger, Yahoo Messenger, IRC, Jabber, Gadu-Gadu, SILC, GroupWise Messenger, and Zephyr networks. With GAIM you can log into accounts on multiple IM networks simultaneously, chatting with friends on AIM, Yahoo Messenger, and an IRC channel all at the same time. ICQ Messenger -- instant messaging (free) ICQ offers the most features, including video/audio chat, email, SMS and wireless pager messages, and the ability to transfer files and URLs. You can also communicate with the Web-based ICQ2Go service that works from any computer using any browser. ICQphone incorporates IP telephony functions so that you can engage in PC-to-PC and PC-to-phone calls. Used in multiple-user mode, groups can conduct conferences or play games. AOL Instant Messenger (AIM) -- instant messaging (free) AIM (part of America Online) lets you chat with people instantly, one-on-one or in a group. You can share photos, monitor news and stocks with personalized tickers, and personalize your messages. It supports voice conferencing and Web collaboration and includes standard chat functions, streaming video, and online games. It also annoys you with plenty of ads, which is just what you would expect from a free program from America Online. Remove viruses, uncover hoaxes, read Microsoft's history, collect Microsoft jokes, download software updates, get support for your Mac or Linux system, and get on with your life without Microsoft interference. CWShredder -- specific removal tool for the CoolWebSearch set of spyware browser hijackers CWShredder can locate and remove most variants of the CoolWebSearch spyware apparatus. Most CoolWebSearch variants target Internet Explorer and its Microsoft Java virtual machine. They can hide in blind links, message boards, and pop-up advertisements (even on mainstream Web pages). F-Secure This European site offers new information daily about virus attacks. McAfee -- includes virus reports and VirusScan software (commercial) McAfee's retail desktop solutions include anti-virus, security, encryption, and desktop optimization software. McAfee also provides free tools to scan for viruses, and AntiSpyware for removing spyware. Symantec Security Response site includes virus reports and Norton AntiVirus software (commercial) Symantec provides the latest information on virus and worm attacks with links to detailed information. Symantec provides a wide range of solutions including enterprise and consumer security, data management, application and infrastructure management, security management, storage and service management, and response and managed security services. Products include Norton AntiVirus, Norton Personal Firewall, and Norton Internet Security. Vmyths.com This site provides information about the latest virus hoaxes. This page lists the 10 worst spyware and adware threats of the moment. Viruses Affecting Microsoft Outlook: Look up the most famous viruses and worms and follow links to analysis and recovery information. The Anti-Microsoft Association This site hosts essays on what's wrong with Microsoft, what you can do about it, and what the government should do about it. While it hasnÕt been updated since December 2001, it offers links to humor pages, books, articles, and reports. Boycott Microsoft This site stopped producing news in 2000, but it offers an excellent time capsule history of MicrosoftÕs dirty tricks, and an informative collection of reader-submitted outrages. The Gneech's Micro$oft Boycott Page Largely the personal opinion of the author, this page includes a "How do you want to crash today?" section of visual and verbal humor blasting Microsoft and in-depth technical descriptions of why Microsoft software is "just plain shoddy." However, this site hasnÕt been updated since 1997. I Hate Microsoft Find out why the author of this page considers Bill Gates to be the focus of evil in the modern world. The Microsoft Boycott Campaign Although this site hasn't been significantly updated since 2002, it lists alternatives, both commercial and open source, for every significant Microsoft product -- with links to their suppliers..
NetAction's Microsoft Archives In May 1997, NetAction launched the Consumer Choice Campaign to focus attention on Microsoft's growing monopolization of the Internet. At that time, no other organizations were working to mobilize Internet users to speak up. NetAction published the Micro$oft Monitor, conducted surveys, and researched and published white papers between May 1997 and July 1999 -- all of which are listed on this page. A Microsoft employee speaks out. Adam Barr, author of the book Proudly Serving My Corporate Masters, describes his 10 years as a software developer for Microsoft. Warum ich Microsoft hasse A hate-Microsoft page with alternatives, for all you folks who read German. This site offers the latest information and troubleshooting solutions for Apple system and software updates. This site and publication has been offering Mac news and information since 1994. This site is a technical support site for Mac users that also offers an email newsletter. This site offers tips and troubleshooting solutions for Mac OS X.
VersionTracker software updates and downloads for Mac OS X This site is the first place to look for free Mac software. It also offers news and updates about bugs and problems with Mac software. DesktopLinux This site focuses on using Linux in enterprises and office desktops. It offers news, opinions, how-to articles, product reviews, a discussion forum, and a resource directory. DistroWatch This site keeps track of Linux distributions and provides extensive reviews and comparisons. Doctor Tux -- support for Linux (free, Open Source) Doctor Tux is a free service that lets you enter questions and view answers from its knowledge base. Doctor Tux also provides expert installation and technical support services on all major Linux distributions, including Red Hat, Fedora, Debian-GNU, SuSE, Mandrake, and Slackware. Doctor Tux works with small companies, including hotels, property management firms, and home builders, as well as folks with home computers, to set up wireless networks of Linux machines. Edgy Penguins -- Linux for Non-Geeks Rickford Grant, the author of Linux for Non-Geeks, provides information online for those "who want to enter the world of Linux but have been holding back out of fear that it is a system for compu-geeks." Frank's Corner This site provides just about all the information you need to get some popular Windows applications and games running on Linux using WINE -- see WINE HQ. Samba for Linux -- file and print sharing with Windows systems on a network (free, Open Source) Samba uses the TCP/IP protocol to interact with a Windows client or server as if it is a Windows file and print server. It enables a Linux or Unix system to move into a Windows Network Neighborhood without causing a stir. Windows users can access file and print services without knowing or caring that those services are being offered by a Linux host. Samba cannot only share directories on a Linux machine on a Windows network, but it can also manage a Windows domain as its domain controller. Headquarters for the WINE implementation of the Windows programming interface on top of X and Unix. WINE is a compatibility layer for running Windows programs that does not require Windows or any Microsoft code. Conversion software for just about every file format for text, documents, and multimedia information (commercial vendor). This site's introduction says it best: "Excel is a complex program, and has been around for a long time. Consequently, it has many obscure nooks and crannies to discover. Some of them are described here." This site provides the best collection of links to troubleshooting information for Portable Document Format (PDF) files and Adobe Acrobat products. Frequently asked questions and answers spanning the entire range of DVD technology. An extremely technical site with highly detailed information about making backup copies of DVDs and converting them to formats for playback on Linux and other systems. Microsoft Office Assistance Page This page provides a list of the file types blocked from use as email attachments by Microsoft Outlook -- more than 70 different types of files are blocked by default. For information on how to block additional file types as email attachments, see the page How to configure Outlook to block additional attachment file name extensions. Microsoft Word: Living with the Beast I don't recommend continued use of Word, but this site provides useful information about avoiding Word's pitfalls and vulnerabilities and turning out virus-free Word documents. As the author notes, Word "is to software as the Irish Elk was to mammals. It is an inherently incurable mass of contradictory impulses, which are fully evident in Word's formatting model. It is the single most miserable piece of software that I absolutely must use." MPEG playback technology recommendations A technical site that outlines the recommended MPEG playback technologies to use for video projects. See also MPEG2 playback considerations for a technical overview of common MPEG issues. News for nerds and "stuff that matters" -- this site covers the entire computing industry and in particular, the open source community from the perspective of software developers. See also the Information Technology (IT) subsection, It is what IT is, for perspectives on enterprise software. Microsoft's "Help and Support" page provides links to information about each format. It also provides Microsoft-blessed sample files in each format so that you can test your playback application.